A while ago Bitcoin launched their online fax service called Bitcoin Fax, allowing users to send faxes online with micropayments by using Bitcoin currency and eliminating the need to sign-up for a monthly plan. Why is this new faxing option causing so much discussion? Mainly because it’s a no-sign up service. Most online fax services are based on monthly plans or annual subscriptions. The features and low price is attractive for businesses big and small, but some people only want to send and occasional fax each month and don’t need a subscription because it doesn’t provide any savings. The new service was announced by developer Simon Males via Reddit where he commented, “Thought I would support the Bitcoin economy by helping those who still need to send faxes from time to time.” So far users have commented positively about this alternative. How does it work? The entire process is simple and straightforward. The design of the website is also easy to navigate and overall it only takes a few steps to send a fax. Keep in mind that only PDF documents can be attached for faxing. If you have any other document type you will need to convert it to PDF format in order to use this service. Also, this service cannot be integrated with Gmail but we still wanted to share this service for all those who are interested in a pay-per-fax solution instead of a monthly plan. Furthermore, this is only a service to send a fax which means you don’t gt a virtual fax number or ability to receive faxes. You can view our reviews for more options that do offer these features. Lastly, we wanted to point out the differences between Bitcoin Fax and websites like FaxZero. 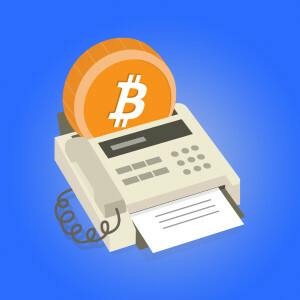 Bitcoin Faxing allows you to send as many fax pages as you need to any fax number, either local or international. Websites like FaxZero only allows you to send a limited amount of fax pages to the US and Canada. In addition, they put ads on the cover pages. For a couple of cents you can send a fax that is free of ads and to any destination worldwide.